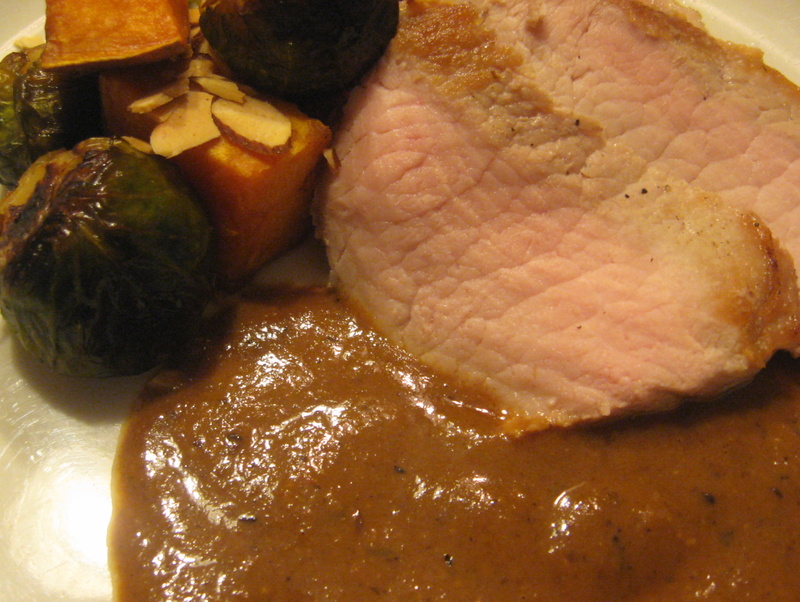 We grilled a pork loin and roasted some brussels sprouts and sweet potatoes to accompany the Molé sauce. I also toasted some sliced almonds for garnish – couldn’t resist! Molé is Mexican in origin (and my thanks to the great Bobby Flay for inspiring this recipe). It’s trademark ingredients are chilis, seeds and chocolate – often with garlic and onions – but after that the sauce is open to interpretation. You’re not going to believe it until you try it, especially after you check out the ingredient list, but have faith! Start chucking ingredients into the sauce pot and wait for the magic to happen – both while you are eating it and then later, too. Hello, aphrodisiacs! Wearing gloves, pull the stems off of each chili pepper and remove the seeds. Set aside. Heat ¼ cup of the oil in a small frying pan until just before the smoke point. Fry each tortilla on each side and then set aside on a paper towel. Fry each chili for 10 seconds to soften. Set aside on the paper towel. Discard oil. Heat 2 T oil in a medium sauce pan over medium heat and saute the onions until soft and translucent. Add the roasted garlic and cook for 1 minute. Add the remaining ingredients, and cook for 1 hour. Transfer the sauce to a food processor and puree until smooth. Be careful! It’s hot! Taste for salt and sweet. Add more honey syrup or salt, if necessary.